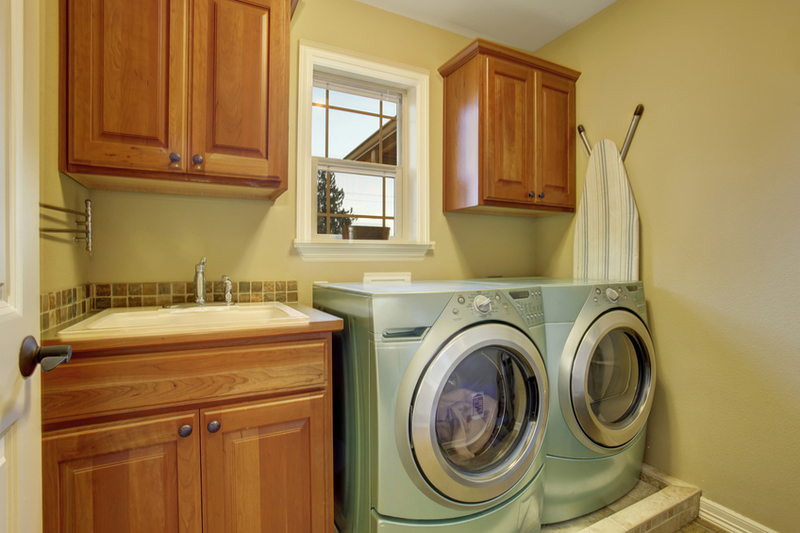 Laundry rooms are often multipurpose rooms that are used for storage and pet care in addition to washing and drying. But they’re typically designed around appliances, and appliances are what you should consider first during a laundry room design or remodel. Top-load or front-load? Both front- and top-load washers have their merits, though Donaldson says many of her clients are choosing top-load appliances. That fits with AHAM’s factory shipment data, which shows that top-load washers made up 76% of units shipped in 2015 and have been growing as a percentage of shipments since 2009. “The reason the front-loader came out was you could have a continuous counter going across,” Donaldson said. Sometimes, the choice comes down to the ease of loading and unloading. “Some people say they don’t want to bend down. The age of the person matters. Where are you in your lives? Designing for ease of access is a consideration for many who choose to pursue a universal design concept during a remodel. If extra counter space is important and you don’t mind bending over to load and unload your laundry, consider front-load models. Agitator or not? You’ll also need to think about whether you want an agitator with your new washer. More of Donaldson’s clients are choosing to go without. Washers without agitators are also growing as a percentage of units shipped. Fifty-two percent of units shipped between January and July of 2016 had no agitator, up from 47 percent last year. After washing and drying: Think about where you’ll store your other laundry-care appliances. Will you need to work in a cabinet for your steamer? Should you build the ironing board into the design? “A lot of people steam their clothing instead of ironing,” Donaldson says. “If they’re steaming, the steamers are usually on wheels. It doesn’t usually go into a cabinet, because you’re lifting up and down. You need to have a space in your laundry room that it rolls into, or a closet you can roll it in and out of. Typically, it’s a tall cabinet in the laundry room, not a closet. A closet is more expensive.” Other cleaning supplies, like vacuums, are often stored in a laundry room cabinet, Donaldson says. Soaked: If your design didn’t include a laundry sink, you may want to consider a model with a sink already built in. Designers: What trends are you seeing in laundry room spaces? How has this space changed over the past 10 years? Tell us about your laundry redesign experiences!